Micro Units Development and Refinance Agency Ltd (MUDRA) Bank, launched on 8th April, is a scheme featuring new and advanced methods for providing funding to the small scale industries. With the striving notion of “Funding the unfunded”, the yojana has been structured keeping in mind the financial needs of the rural public. Especially in rural and interiors parts of the country, most of the inhabitants are deprived of the banking and financial facilities, which are easily accessible in the cities. Hence, poverty-stricken small businessmen cannot avail the benefit of financial instruments and other financial services such as insurance, net banking, credit cards, loans, easy money transfers etc., which hinders the growth of their small scale businesses. They don’t have easy access to banks, where they can apply for loans and get them approved. Hence, they have to rely on local money lenders to borrow money for investing as capital and to run day to day expenses for their business units. Since money lenders, charge high rate of interest from the borrowers, it becomes unmanageable for them to return the principle amount on time along with the interest. As a result of which many farmers and small entrepreneurs have to sacrifice their lives and consequently generation after generation have to bear the pain of paying back the loan to them. Ultimately the entire process of procuring loan and refunding it back to the hard-hearted money lenders become burdensome. There are approximately 5.77 crore small and medium scale business units which take manufacturing, producing, retailing and trading as their major activity. Most of them are sole proprietorship farms. If compared with the large and much-organized sector set up in the cities, there is a huge scope of improving the financial conditions in the rural area. Many different surveys suggest, if Government takes proper steps helping the small scale sector in the rural area, the economy of the country would definitely show an increasing growth. Keeping this condition of the country in mind Government of India, has announced the launch of MUDRA bank. This scheme will dispense loan starting from 50,000/- INR up to 10,000,00/- INR to the small scale enterprises. A fund of 20,000 crores has been allocated for bringing this scheme in practice. The main objective of MUDRA is to provide refinance for micro units to commercial banks, NBFCs, RRBS, cooperative banks, MFIs. Under refinancing, MUDRA will cover small retailers, shopkeepers, women entrepreneurs, Manufacturing and service enterprises in rural, semi-urban and urban areas. Apart from refinancing, development of financial literacy support is also offered by the bank. Under this, Skill development, entrepreneurship, marketing training and financial literacy will be offered. This scheme will lend money to the borrowers in three different segments. As per the first segment Sishu, bank will provide loan up to 50,000/-, as per the second segment Kishor, bank will lend money up to 5 lakhs and for the last segment Tarun, a bank will pay up to a maximum of 10 lakh to the borrowers. The main focus of the government would be, to direct 60% of the borrowers to the first segment i.e. Sishu. But depending on the scale and growth prospects of the business, bank might decide the loan payment under Kishor or Tarun. Many other benefits are also customized under this project, which are yet to be implemented. The introduction of preloaded approved Mudra card is one of the major benefits, a borrower can avail. This pre-loaded card would enable them to buy raw material, heavy and light machinery for their business on an online platform. This card would be linked with Pradhan Mantri Jan Dhan Yojana Savings Account, and borrowers can easily withdraw money whenever they require cash in hand for the business units. The latest design of the card is being approved by DFS, and guidelines for the handling the card is attached for the ready reference. 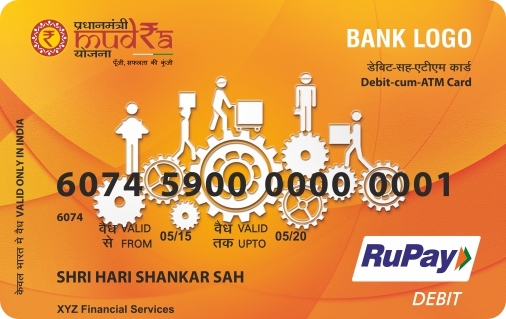 All eligible beneficiaries can get this Rupay Mudra Card. The maximum limit for cash withdrawal under this card has been restricted to 25,000/- INR per day, any ATM. Appliers of the card would have the option of personalizing with their name on the front side of the card. This card will cover both cash credit and current deposit account. At the beginning stage, cards enabled with magstripe will be issued. A default insurance coverage of 1 Lakh will be an add-on advantage. Bank has not waived off any transaction charge for each transaction done through the card. This is applicable from the first transaction itself. The offers made under this scheme looks promising and fruitful. Not only it will help the small enterprises to run the business efficiently, it will also help the economy grow at a faster rate. This scheme is another step ahead towards the globalization of the Indian Economy.